NATO Article 4 calls for members to “consult together whenever, in the opinion of any of them, the territorial integrity, political independence, or security of any” is threatened. Article 5 considers an armed attack (real or otherwise) against one or more members, an attack against all. Collective self-defense is called for – perhaps in the wake of the Paris incident all-out war on humanity, risking global escalation if confrontation is provoked with Russia or China. 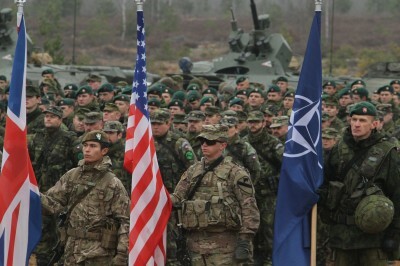 Unleashing US-led NATO’s killing machine could become the war to end all wars, risking world peace and humanity’s survival. Republican presidential aspirant Marco Rubio called for “invok(ing) (NATO’s) Article 5,” requiring all 28 Alliance nations to defend a member under (alleged) attack. His rant followed French President Francois Hollande calling the incident “an act of war,” automatically blaming ISIS despite no evidence proving it. The only previous time Article 5 was invoked was after the 9/11 attacks. Obama’s deputy national security advisor Ben Rhodes called what happened “an act of war,” a clear indication of what’s coming. NATO Secretary-General Jens Stoltenberg said member states are ready to assist France. “We stand strong and united in the fight against terrorism,” he blustered, a near declaration of all-out war. “The Islamic State is an apocalyptic organization overdue for eradication,” he ranted – ignoring his full knowledge of it being a US creation, used as proxy foot soldiers. “The terrorists who attack us have the same murderous intent as those in Paris” – ignoring his all-out terror war on Palestine and possible complicity with almost certain state-sponsored terrorism against Parisian civilians. Israeli defense minister Moshe Ya’alon blustered: “This must be a time of reckoning,” suggesting the worst to come against Palestinian civilians, defenseless against Israel’s rampaging killing machine. “The challenge for threatened countries is huge,” Times editors barely stopping short of urging greater US-led war on humanity than already – never explaining ISIS is a US creation, used to wage war on Syria, Iraq and other targeted countries, heading for Russia if not stopped. “France must take measures to protect its citizens, as must the United States” and other countries, Times editors blustered, ignoring what’s most important to explain to readers.